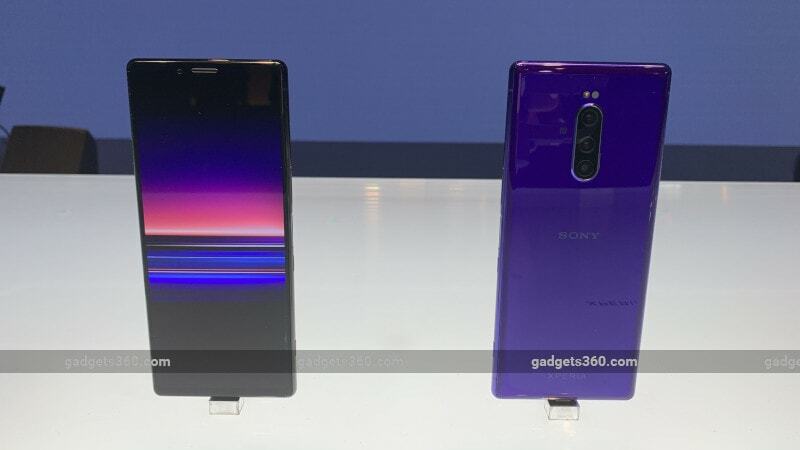 Sony Xperia 1 with an ultra-tall, 21:9 CinemaWide display and HDR support has been launched at Mobile World Congress (MWC) 2019 in Barcelona, Spain. The new Sony phone, which comes as a successor to the Xperia XZ3 and was initially rumoured as the Xperia XZ4, is also touted to be the world’s first 4K OLED phone. Sony has also provided a triple rear camera setup on the Xperia 1 that is powered by an Eye AF technology and supports up to 10 fps burst shooting with AF/ AE tracking. The Xperia 1 additionally comes preloaded with a Creator mode that is touted to deliver a professional-level colour accuracy. There is also a Dolby Atmos integration to offer a surround sound experience. While Sony at the launch and in its press statement didn’t announce a price, it is being reported the Xperia 1 price will start at EUR 799 (roughly Rs. 74,200), and it will go on sale in the US from late Spring in Black and Purple colour options. The new model in the global markets will get Black, Grey, Purple, and White colour variants, through. What makes the Sony Xperia 1 a distinguished offering from the likes of the iPhone XS, Samsung Galaxy S10, and LG G8 ThinQ is its ultra-tall CinemaWide display that works with an all-new multi-window UI. The smartphone also has a dedicated Game Enhancer feature that enhances your gaming experience on the large screen. For photography lovers, the Sony Xperia 1 comes with a Dual photo diode technology that is designed to provide fast autofocus even in low light conditions. The handset also has technologies such as RAW noise reduction, Eye AF, and 10fps AF/ AE (autofocus and auto exposure) in the burst mode. There is an Optical SteadyShot technology on top of a hybrid stabilisation system that uses a unique algorithm to resist shakes and jerks while capturing objects on the move. Moreover, the camera setup of the Xperia 1 is touted to be developed in collaboration with engineers from Sony’s digital cinema camera division, known for its CineAlta brand. This brings features such as a Cinema Pro mode that provides expression-based colour management presets and as many as eight different experiences to transform regular clips into cinematic shots. The dual-SIM (Nano) Sony Xperia 1 runs Android 9.0 Pie and features a 6.5-inch 4K HDR (1644×3840 pixels) OLED CinemaWide display along with a 21:9 aspect ratio and Corning Gorilla Glass 6 protection. The display panel supports 10-bit tonal gradation and has a wide colour space ITU-R BT.2020 and DCI-P3 with Illuminant D65. Further, there is a Master Monitor colour reproduction. The display is also powered by Sony’s X1 for mobile engine. Under the hood, the Xperia 1 has an octa-core Qualcomm Snapdragon 855 SoC, coupled with 6GB of RAM. The new chipset is touted to help offer up to 25 percent faster CPU performance and 40 percent GPU performance than the previous generation. Also, there is the Snapdragon Elite Gaming to handle specifically processor-intensive apps and games. For photos and videos, the Xperia 1 has a triple rear camera setup at the back. The camera setup has a 12-megapixel primary Exmor RS for mobile sensor with an f/1.6, 78-degree lens as well as OIS photo and hybrid OIS/ EIS video stabilisation support. Also, there is a 12-megapixel secondary sensor with an f/2.4, 135-degree wide-angle lens and a 12-megapixel tertiary sensor with an f/2.4, 45-degree, telephoto lens that provides 2x optical zoom. The setup also features OIS photo and OIS/ EIS video stabilisation support. There is also an 8-megapixel sensor at the front for selfies and video chat along with an f/2.0, 84-degree wide-angle lens. The rear camera supports features such as Cinema Pro powered by CineAlta to support 21:9 movie recording, LOOK colour settings, 4K HDR video recording, RAW noise reduction, Eye AF, Bokeh effect, HDR photo, and 3D Creator. The front camera, on the other hand, comes with features such as HDR photo, SteadyShot, Portrait selfie effects, Display flash, and a 3D Creator. The Sony Xperia 1 has 128GB of onboard storage that is expandable via microSD card (up to 512GB). Connectivity options include 4G, Wi-Fi 802.11ac, Bluetooth v5.0, GPS/ A-GPS, NFC, and USB Type-C. Sensors on the Xperia 1 include an accelerometer, ambient light, barometer, fingerprint sensor, game rotation vector, geomagnetic rotation vector, gyroscope, hall sensor, magnetometer, proximity sensor, and an RGBC-IR sensor. Besides, the phone packs a 3,300mAh battery that supports Xperia Adaptive Charging and comes with Smart Stamina and Stamina Mode.